MOSFET requires very careful handling particularly when out of circuit. In circuit a MOSFET is as rugged as any other solid-state device of similar construction and size. MOSFETs have an ultra-thin silicon dioxide layer between the channel and the gate. Because the insulating layer is so thin, it is easily destroyed by excessive gate source voltage VGS. On application of large gate voltage, an open-circuit gate may accumulate enough charge so as to develop an electric field large enough to puncture the thin Si02 layer. Aside due to direct application of an excessive gate-to-source voltage VGS, the thin Si 02 layer may get destroyed in more subtle ways. If a MOSFET is inserted or removed from a circuit while the power is ON, transient voltages caused by inductive kickback and other effects may exceed VGg /max rating. This will wipe out the MOSFET. Even picking up a MOSFET may deposit enough static charge to exceed the VGS (max) rating. Generally, ground rings are used to short all leads of a MOSFET for avoiding any voltage build up between gate and source. 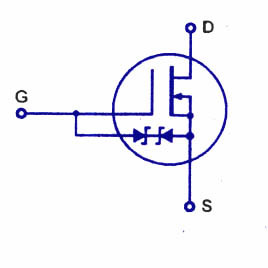 The grounding or shorting rings are removed after the MOSFET is connected in the circuit. Sometimes conducting foam is applied between the leads Â Some MOSFETs are protected by built-in Zener diodes in parallel with the gate and source, as shown in figure. With normal operating voltages, the Zener diode remains open and does not influence the working of the circuit. In case of an extremely high VGS, the Zener diode breaksdown thereby limiting the gate potential to a value equal to the Zener diode breakdown voltage, much smaller than VGS max rating. The disadvantages of these internal Zener diodes are that MOSFET’s high input impedance is reduced. The tradeÂ­off is worth it in some applications because expensive MOSFETs get easily destroyed without Zener protection. MOSFETs are delicate devices and can get easily destroyed. So they are to be handled carefully. Further-more, they should never be connected or disconnected while the power is ON. Finally, before picking up a MOSFET device, get your body grounded by touching the chasis of the equipment you are working on. 11W inverter has to be build by mosfet. I like to thankyou a lot, because I am getting a lot of knowdge from your website. I’m also requesting you to give me a circuit of 11W fluorescent lamp .